Do you need full-service Website Design? FindTech can help you become more than you are, put your best face forward, and really shine! Click on the graphic at the left to see some samples of websites we’ve done. Each site is customized to our customer’s particular needs and concerns. 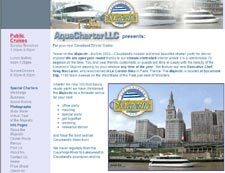 This particular site design of the Majestic Yacht that cruises the Cuyahoga River won 2nd Place at the 2002 Digital ArtZ Competition. When you have a website, the only way the world can see it is to sign up with a hosting company. Then, once you've done that, you need an easy way to manage the files and gather information about your site.